Don't give a point-by in a race unless you plan on yielding the pass. Don't take a risk thinking that the other driver is going to predict your moves and react accordingly. That being said, I saw the cardboard-roofed Miata take a few high-risk passes this weekend. Say What?!?! This is false!! We “team DamSon” wer accused of having a locking Diff. As a matter of fact several members of team Jacky Ickx came up to us afterwards admitting to filing the protest!!!! Jacky Ickx did not protest. Jason Crist Thanks for working with us. As we came off the track a Champ Official asked our driver and crew something along the lines of “how was that posi-Trac diff?”. We felt at that point we were being challenged since 1- we have a factory open differential and 2- we certainly didn’t have an aftermarket diff in our logbook. We assumed at that point we were under protest. Thanks again for challenging the compliance of our car, we are 💯 for compliance and look forward to Champ being as aggressive as needed to ensure vehicles are competing by the rules. Say What?!?! This is false!! We “team DamSon” wer accused of having a locking Diff. As a matter of fact several members of team Jacky Ickx came up to us afterwards admitting to filing the protest!!!! We were indeed instructed to remove diff cover to prove we were legal!!!! You might have your facts confused. I was witness to most of what happened. Champ Tech identified the issue, then solicited teams to protest the car. When that didn't happen, they congregated the winning teams from the race to decide the best course of action. We actually provided the protest form for another team to file the protest. And it wasn't Jackie Ickx. What a novel idea, I wish everyone did that. For us, as @Huggy mentioned we got taken out by an EC car and nobody came to talk to us. I waited thinking they were working on their car, but looked back a few minutes later and everyone was gone from that crippled car. After an hour or so, I went to the pit stall and was told the team principle was not there so I left word for someone to come talk to us. Still waiting. Not the way that is supposed to be handled. Aaaaannnnyyyway, back to the race. Saturday we spent the morning climbing slowly up a very fast field. Fastest I have ever seen in CC. We made a call to pull our first stop early with @Hurljohn getting out and Chris getting in, toward the end of Chris' stint the car was up to 5th overall with three EC cars in front so we are looking good. Then tried to stretch the fuel one lap too long to keep our window in reach and locked up the in-tank pump. Then the main pump air locked. Took forever to get it resolved and back on track. Just a bad call to stretch it on my part, but had done the same in similar situations in the past and got by with it. At that point, we decided to just lay down a few laps each since I hadn't driven yet and bring it in to get ready for Sunday. Sunday we start further back and have trouble making any headway in that field. About an hour or so in a car slid into us at 17 and nailed our right rear, broke the wheel and knocked the toe out. Swapped a new wheel, adjusted the toe by eyeing it, sent John back out. Did our fuel and driver swap, Chris in the car, laying down good laps but still buried in the field, then the incident at 7 with the EC car blowing the braking zone and crashing into that same brand new never run before right rear tire/wheel. Hard hit, took out the shock, upper control arm, cv axle, and the wheel. Had everything but the shock, never thought I would need a spare shock. An exact replay of our 944 getting taken out by a rental driver at turn 7 back in 2014 (edit: it was 2013 not 2014). 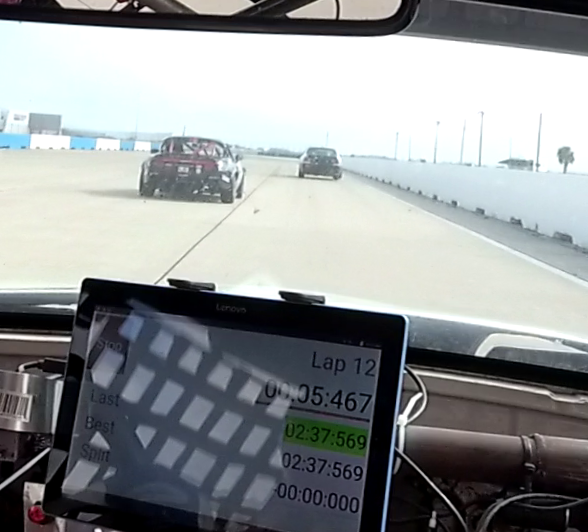 Just bone headed blowing the braking zone taking the inside line and slamming the car turning in. At least the guy back in 2014 came to talk to us. Blew a supposed three year old trailer tire an hour into heading home this morning so had to change that on the side of the road. Decided it was too far away to chance the rest of the trip with no spare so had to deal with that for a few hours before continuing the trip, just icing on the poop sandwich of a weekend. But, we all had a good time hanging out and visiting all weekend so it's not all lost. Good job Dana, Ray, Jay, Al, Jimmie and the rest of the gang I am forgetting at the moment. Good job by the broadcast crew, caught a bit of that between working on the car, etc. On to the next race. Noted.. if that’s the case then I stand corrected. As I mentioned on the Facebook post we have no hard feelings toward anyone or team, however it was more then just us “offering” to show diff. I had deleted my initial post on here cause no one wants any forum drama. Anyways.... it was a great event and we all enjoyed it immensely. That doom thing is no joke, all you see is a little puff between shifts as it blows by. That black puff is broken/evaporated Honda dreams and Bmw tears. Lol. glad you enjoyed the abomination that it is. I'm happy you have corrected yourself. Just in case you still have any doubt. Team Jacky Ickx never filled a protest in its 10 years of running this kind of racing! Team Jacky Ickx is not planning to file a protest any time soon. We trust Champcar. After the long "deliberation", and I found out your car was legal, I personally went to talk to Dana telling my team was fine with Champcar's call, adding we don't want to win like this! A little later, Clark from my team went to talk to some members of your team loading your car, congratulating you on the win, telling you we were fine with the "call"! Please don't start rumors about my team which could damage a good reputation we take pride in! here’s the link to a google drive with the photos from the weekend. The full resolution photos are available for purchase at $6 each, or $21 for 5 if anyone would like them. Right on. 👍🏻👍🏻 Nice racing with you all. As I stated before, we are all for the protest process, when needed. It helps keep a level playing field. Yes, I will agree that the point by was premature. And he was off the racing line WAY BEFORE the corner. So why would anybody with common sense throw that in from that far back. He never "turned in on him", when he already committed to turn in before partsbadger here was even in the brake zone (which he actually didn't even use). @TheJohnDavison and @LuckyKid appreciate the backing of the drivers on your teams but it is all second hand. I was driving the PartsBadger car, after my stint I walked over and talked to the driver and thought we cleared the air for the most part, as @LuckyKid said, we are sorry that it happened. What I do like is hearing what ﻿people have to say about it. I agree with both sides, I feel it was my job to pass cleanly. When I personally give a point by it is an acknowledgement that I know you are faster than I am, I see you and please come on by. Sure it expires but I felt that it hadn't and I will also explain my side with a few snapshots to explain my thought process. I appreciate your response here and I agree with most of what you said. I am less fired up now about the actual incident, as much as I am the reasons that some on here think the move was justified. Yes, we all make split second rash decisions, and this happens very quickly, I get that, and I appreciate you realizing the decision may have been questionable. I understand our driver gave an early point and was on a "weird" line I would say. But, I am more fired up that some people on here aren't understanding that just because there was a point-by given, it doesn't make it a wise decision to take the pass. The reason this fires me up, is because this type of thought process will keep continuing on, and more incidents like this will happen. People show me point-bys all the time, all race long, but that doesn't mean I assume it is my corner and take every opportunity. I have to realize that the guy in front of me has to turn in eventually, and if I'm too far back, I will back off and set up a run on the exit. I think this is a learning experience for several people, including our driver, which I believe he will post about. Holy Smokes , I would have thought that point by was null and void 100 yards before you made contact..at the point of that contact the leading driver has to have started his turn in..where's he going to go !..I don't think point by's are useful in a race unless the leading car has a mechanical disability and is limping in...And nice job driving that cardboard miata overall , very impressive in car footage.. I've given a few point-bys in a race, if I do so I back off the gas to ensure the overtaking car gets around quickly. It's a long race, not conceding the corner isn't going to make or break me. If you don't plan on allowing the car to get around you, or if he waves it off, don't give a point-by and keep driving hard, it's their job to get around you. Exactly. Sometimes there are situations where it actually helps you to maintain your momentum through the next turn to get a fast car on past and out of the way. In a future race if I see the “cardboard Miata” catching me I am going to point him by just so I can laugh as he goes by. It's easy to play armchair driver on the forum, but looking and reading everything, I agree the initial point by was way early, if not outright strange given that you were still a good bit behind. But with that being said, the point by was before start finish, in the pic above you are under or past the bridge and presenting yourself to the opposite side of the original point by (at this point it was given half of a straight away back...). If I am the driver in the car that gave the point by, I glance up in my mirror and see you track right with a track left point by, I can't say that I am expecting the aggressive left side pass entering T1. Just my opinion. The whole situation was just weird. He was still pointing by as I passed start/finish but I agree I was a ways back yet. I don't know that it was a track left point by either as much as it was a "go around me" but nonetheless I did not have the intention to go inside, just made a bad decision to go inside when he bounced outside to brake. I left pit lane to spectate for a bit around 11:30 AM on Sunday at turn 17. I saw the cardboard miata do a full send into turn 17 and thought there is no way that car is making the corner, and sure enough, it spun right under the bridge and narrowly missed getting hit by the pack of cars behind. @Racer7x How was your race dude? PartsBadger (414 Mazda Miata) had a not so great weekend, but a great learning experience. We are a 2 driver team from Milwaukee and we needed crew. LowTide Motorsports was that and then some. It was our second race and first time at Sebring, which is an amazing track! Day 1, first lap, our transmission got stuck in gear. The LowTide crew got us swapped out in about an hour, but it then became a test day. We spent the rest of the day dealing with high temps and learning the track. We ended the day with engine temps running at 235-240 and needed a solution for Sunday. I reached out to Justin, who runs with a miata team, and he graciously offered up his radiator in the spare car he brought, so long as I took it out and brought it back in the condition it started in. He said is was the blue miata on the trailer in the paddock. I got dinner with the fam, got back to the track and looked for his blue Miata. I found the miata, took a picture of it and sent it to Justin just to confirm its the right one. I didn't get a reply for about 5 minutes but figured the car matched, the radiator brand matched, and the location seemed to match he must have just rolled it off the trailer and put the hood up for me, so i uninstalled the radiator and put it in the Miata. Then at some point my phone went into airplane mode. I tested the car again and it was still getting hot, so I popped the thermostat for good measure and went back to the RV for shut eye at 10:30pm...Then I check my phone, turn off airplane mode and get all my old text messages. Turns out that WAS NOT HIS CAR. I had just literally stole someones radiator. A bunch of loud cuss words came out and my Co-Driver went to install the stolen radiator while I tried to find the owner. Luckily the owner of the car was back and incredibly considerate and understanding. We had a great conversation and returned his radiator. Thank you Karl (EC Miata) for that! We then reinstalled our stock radiator and hit the hay a little after mid-night. Day 2 comes and we are off to a great start. We finish the first stint in the lead overall(non EC) and the car feels great. Temps are now running around 220-230 without the thermostat. But one of our wing supports let loose (Which Bill specifically mentioned we should reinforce). We had a stumble at the pits repairing that and I having trouble breathing with my visor down and start tossing my cookies which cost us an extra minute in the pits. We are also doing worse on fuel than we thought and we tell my co-driver to short shift to save fuel and we drop to 2nd place. Meanwhile the medics come to check me out ($$$). I feel much better once my helmet is off and I get some water. About an hour later we see on the live feed my Co-driver is driving slow and the car is making racket. He pulls in and it turns out the exhaust fell off and the weld on the wing broke. So we pull off the wing and we are between pit windows and confused on what to do. We decide to short fuel and swap drivers and continue as is. We exit the pits about 5th overall, but struggling to keep pace with the imbalance of the car and short shifting to keep exhaust heat down. About an hour into that stint, I was struggling greatly and my driving was all over the place. I was not making good choices and in the video you can tell I wasn't really "with it". During the double yellow I end up driving into the tire wall at the exit of 17, the impact was dramatic but not very hard. I start getting really hot waiting for the safety crew and can't get my visor open. I get out of the car and feel really bad and start vomiting. I get in the ambulance($$$) and can feel my blood pressure dropping and was getting pretty scared. The hospital transport($$$) comes and puts on the CO monitor and finds I have carbon monoxide poisoning. After 4 bags of IV fluid and a tank of oxygen($$$) I start feeling better and they discharge me. When I get back to the track every thing is loaded up, so a big thank you to LowTide for taking care of that. Overall we learned several valuable lessons about taking care of ourselves and will now be investing in window vents and cool suits. We will also be changing our exhaust setup and making contingency plans. Its just not worth risking our health and it will certainly end up costing much more with an out of network ER visit. We've got a lot of changes to make for Road Atlanta and hopefully we've got the bugs worked out and can finish strong there. We will be looking for a 3rd driver for Road Atlanta, ideally a Pro or top tier driver with Miata experience! The car is fast and has the potential to win. 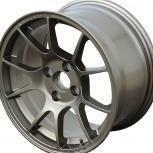 PM me if you are interested. Thanks Everyone for the Great Competition! Do yourself a favor ax the wing and add the rear of the car back on. Why could you not open your visor ? Why short fuel when you take the fuel cap off it's 5 min for 1 gal or 50. Are you aware that a Miata lost an exhaust at Thompson in Oct and burned with the driver badly injured ? You were severly dehydrated from what you described, consider yourself extremely luckly. Cool shirt will help But fresh air to your head is more important. You'll be sensitive to carbon monoxide for awhile now. Roy, glad you are alright. That has never happened to me, but I do know others it has happened to and it is not to be taken lightly. Jimmy, thanks for your post. You are correct, It is you and I that should explain the facts and thought processes, and here are mine regarding the T1 incident. I continue to gain positions, but as we all know, the closer to the front you get, the harder it is to pass. I settle in with a C class BMW that seems to have the same pace as I do. He is better on the straights, I am better in the corners. I occasionally get close enough to attempt a pass but one of my rules is to bring the car back so the next driver can have some fun. 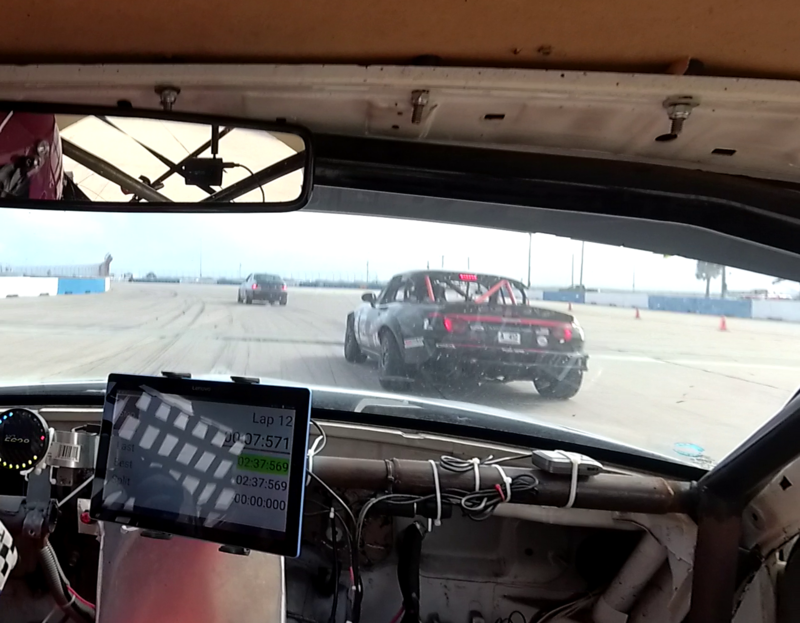 Checking my mirrors exiting T13 I notice what I think is the #414 Parts Badger Miata behind me. As I exit T16 I can see it is indeed the #414. I watch the gap as we enter T17 and calculate that, because of the previous pass that car made on me earlier in the stint, he would motor by me down the front straight. Exiting T17 I decided to give a point by (again, vigorously, my style) out the window as I wanted him to go by on the left. When he (Jimmy) didn’t go by like I expected, I moved left to set up for a possible pass on the BMW into T1. I could see that I was not close enough to make a safe pass, so I moved back right to set up for a better turn-in angle. 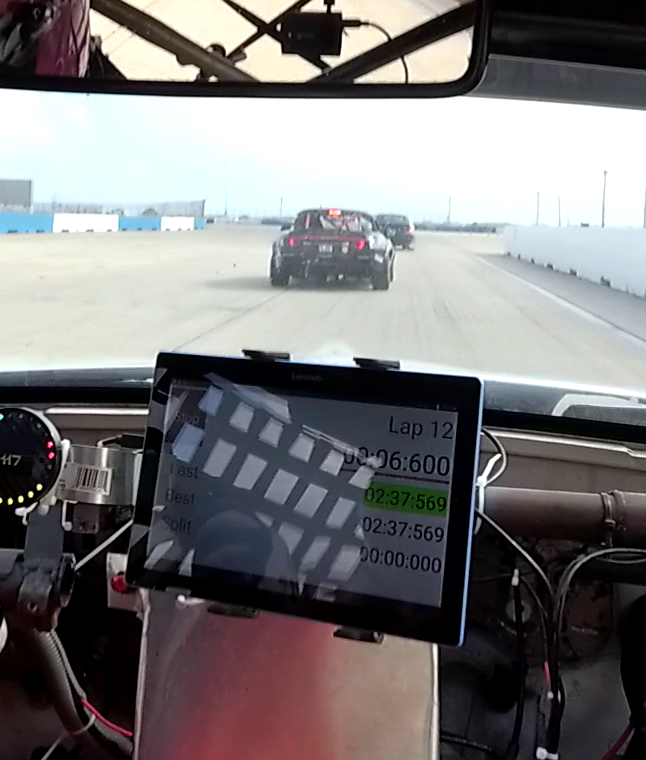 At this point I was focused on the brake zone and turn in of one of the fastest corners on the track and presumed the #414 would simply follow. That is where Jimmy made his decision to try his pass and I turned in and got back to throttle. The result of those two final decisions has already been discussed. Jimmy came to me after I cooled off, we spoke, shook hands and it was done. 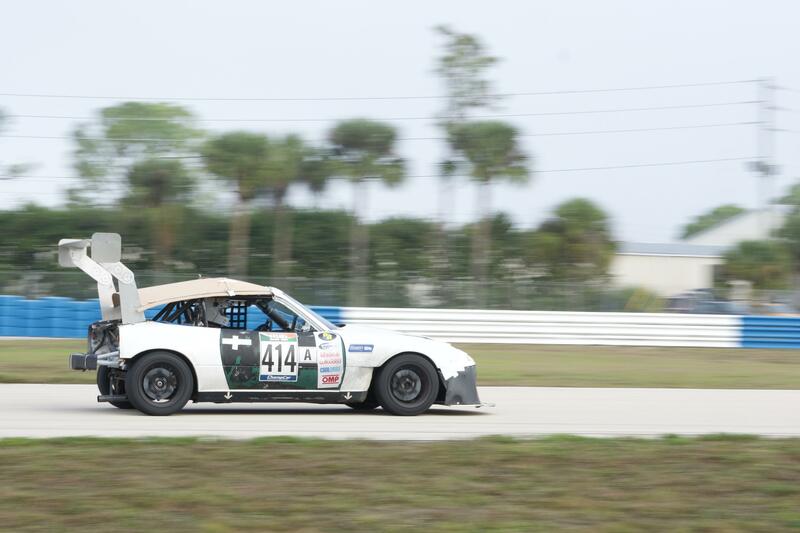 Those are MY facts and mindset of what transpired between the #414 Parts Badger Miata and the #412 Level One Racing Miata in T1 at Sebring. I would like to apologize to the Parts Badger team for coming to your pit and getting loud, venting my frustration. That is the first time in 25 years of racing I have done that and it was inappropriate. Again, my apologies. I also feel compelled to mention a few other, possibly non-pertinent items (facts?) These comments are not directed at anyone, but simply stated for potential food for thought. I started the Level One Miata dead last on the field and at the time of the T1 incident I had moved into 7th position. When I point you by on the straight, that is where I expect you to pass me. If I point you by in a brake zone, into a corner, I will give you room so we can co-exist. Pointing you by on a straight does not mean out-brake me 1000’ later into a corner. I have always treated a point by like a passing flag. It is for information only and not a must. I give it like that and I take it like that. In slow, out fast. Be smooth, look ahead. An ounce of image is worth a pound of performance. If you can’t be good, look good. It’s always better to be lucky than good. Great expectations bring great disappointments. Thanks to the Champ Car staff for again providing this old man an opportunity to live the dream of endurance racing that I fell in love with the moment I attended my first 12 Hours of Sebring in 1979. 2019 will be my 40th consecutive year of attendance. Naw I'm 14yrs younger than you besides age is just a number, Let me know when your looking for another driver for Florida races.